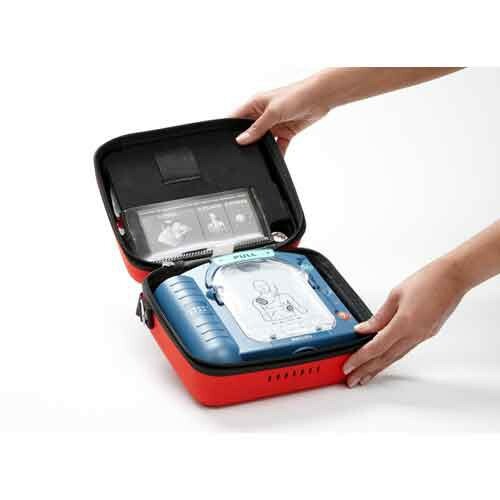 AED Device with Slim Carry Case - SHIPS FREE! Having an automated external defibrillator (AED) on-site can save a person's life case of a sudden episode of cardiac arrest. Philips Medical has created the HeartStart OnSite AED to be readily available for use when such an emergency has happened. A simple tool, the AED has step-by-step guidance with a user-friendly interface that makes it easy to understand and use in a key situation. Voicing out instructions as you proceed, Onsite will prompt the user on how and where to place the pads, how to deliver the shock and perform CPR if needed. The instructions to the HeartStart adapt to you as you move along, moving at your pace so there aren't any missed or unnecessarily repeated steps for its usage. To help calm the nerves, the AED will include additional instructions, rephrase or repeat a step if needed. Aside from verbal commands, it also offers visual queues for better understanding. OnSite's level of intelligence goes into full display once the item is properly applied. With its "personalized therapy" feature, OnSite will automatically check to assure a shock is needed. If the infant/child pads are used, the AED adjusts to a lower energy level and changes instructions on how to properly apply the necessary CPR. Once in performance, OnSite delivers some of the fastest shocks needed for proper treatment after CPR has been completed. The AED is also very easy to use and has been utilized as a great training aid. 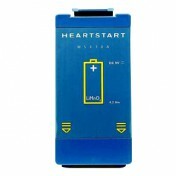 Since the pads and battery are already installed, using the OnSite requires a simple pull of a tab for an initial "self-test" before using it on the person. This assures the OnSite is ready to be used at a moment's notice. You can also train an entire class of CPR students thanks to training pads that come with the OnSite. The specialty pads put the defibrillator in a training mode that includes eight emergency scenarios, complete with instructions and walkthroughs for each one. No matter the situation, this AED has you covered. Each AED includes an owner's manual, quick set-up guide, maintenance booklet, reference guide, a pre-installed battery, one set of SMART Pads Cartridge and a user-selected carrying case.